One Giant Leap for Man, One Giant Leap for Robots! 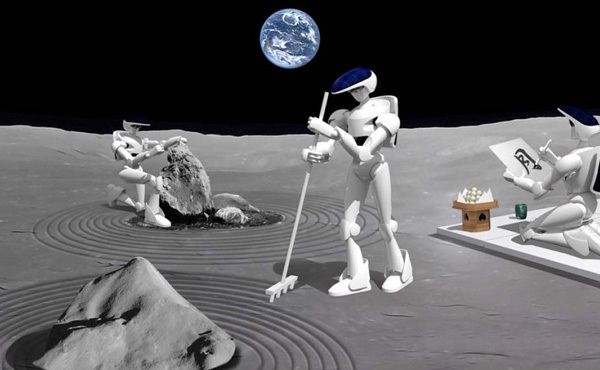 Robots have been employed by a number of NASA’s missions in the past, particularly those to the Moon, where they have been used to scan the surface and collect samples and various kinds of data. NASA has also been a pioneer in semi-autonomous robots exploring the surface of Mars; the twin Mars rovers Spirit and Opportunity are still operating on the surface of the Red planet several years after their initial mission was completed. The Phoenix robot successfully landed on Mars last year and completed its 3-month mission. Moreover, NASA is preparing to launch soon a new generation Mars rover aka the Mars Science Laboratory while testing the ATHLETE rover for a mission to the Moon. But none of these very cool robots have been able to walk—or build Japanese rock gardens. In a presentation entitled “Realization of Moon Exploration Using Advanced Robots by 2020,” Toyota shared plans about the future use of its innovative Toyota Partner Robot series. Initially, these humanoid robots were designed to help with life down here on Earth, specifically with elderly care and assistance. A result of Japan’s aging population and a lack of labor force, they are able to perform a variety of tasks, including transporting passengers and helping citizens in need. Their application, however, is set to be taken quite a big step further—to the moon. That last one paints quite the endearing picture of our robot helpers working all day and camping out beneath the stars at night on a lonely desolate planet. With 2020 being the proposed date, however, we are still a decade away from finding out whether this is yet possible.